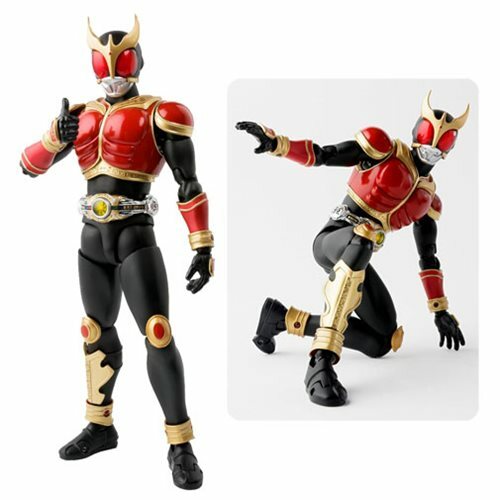 The powered up Kuuga Rising Mighty Form is coming to SH Figuarts in the highly realistic shinkocchou line! The true to form proportions in this Kamen Rider Kuuga Rising Mighty Form SH Figuarts Action Figure balance the body proportions so it looks like he came right out of the show! Specially crafted armor and waist parts let you recreate Kuuga's battle stances from the show and the gleaming compound eyes are rendered in exquisite detail. Also included is an optional hand parts for recreating the "Thumbs Up" pose as well as 3 other pairs of interchangeable hands! This action figure stands about 5 1/2-inches tall. Ages 15 and up.